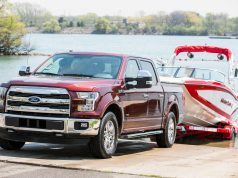 When it comes to bragging rights pickup truck manufacturers too often get hung up on towing capacity, playing the “mine is bigger than yours” game. Don’t get me wrong. Tow ratings are important. You have to feel secure and confident on the road. And your boat and trailer need to be safe. But what about the rest of your boating stuff? Dedicated day-cruisers need to be able to haul coolers, people and gear while anglers can add fishing rods and tackle to the list. 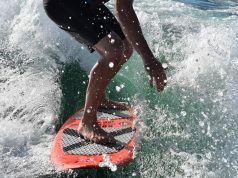 Watersports lovers need room for skis, boards and wetsuits, maybe even slalom buoys. Cruisers need room to haul everything from tools for off-season projects to pre-departure provisions. That means cargo space and management systems are important too. Some truck owners opt for a hard bed-cover or soft tonneau. That creates an enormous trunk-like space but limits the height and length you have available. Of all the trucks I have driven recently, a well-optioned Ram has the best combination of out-of-sight storage space and rear bed setup. Its unique RamBox Cargo Management System makes Ram the storage wars winner on the market today. For most boaters, a crew or quad cab makes the most sense, with seating for weekly non-boating use and potential rear seat space for the weekends. Fold-up rear seats and an absolutely flat floor makes the Ford F-150 a top contender for back-seat cargo convenience, but the Ram 1500 Crew Cab and Quad Cab models have a full-width under-seat locker that lets you get plenty of gear out of sight, plus an optional fold-flat floor that can make it more convenient for loading more luggage and gear. 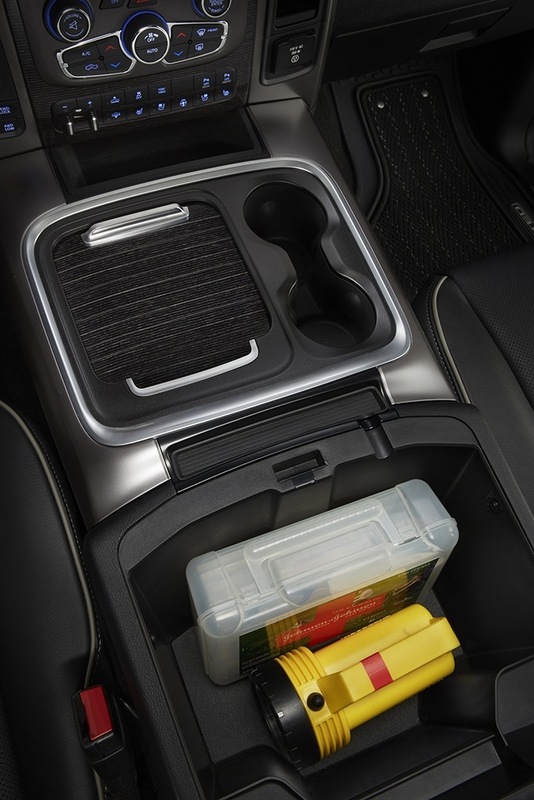 Depending on the interior layout you choose, Ram has spacious front-seat console lockers for storing boating electronics, sunglasses and hats. Ram’s ace in the hole is the twin waterproof, locking and lighted RamBox lockers located above the wheel wells in each side of the four-foot-wide rear bed. They are 51.6 inches long with the 5’7” bed and 60.2 inches with the 6’4” cargo bed. It’s amazing how much boating gear they can swallow: PFDs, water skis, fishing rods, you name it. 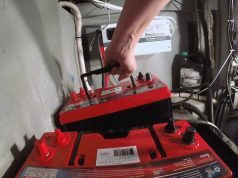 If you’re not using your truck for work during the week and don’t need to fill the lockers with tools, you can leave your boating stuff locked, loaded and ready for the weekend — or for quick mid-week escapes. When you’re ready to load up in earnest drop the tailgate to get up to eight feet of length. The Ram system has a U-shaped cargo box extender that easily clips into toggle latches to keep it in place and to keep long, wide loads secure. There are full-strength tie-down points inside the box plus a built-in rail system on the box sides with four cleats that are easy to move. For keeping shorter loads in place, the sides of the box extender fold in, and side pressure pads turn it into a box divider. You won’t have to worry about the cooler or your duffel bags of gear sliding back and forth in the cargo bed. 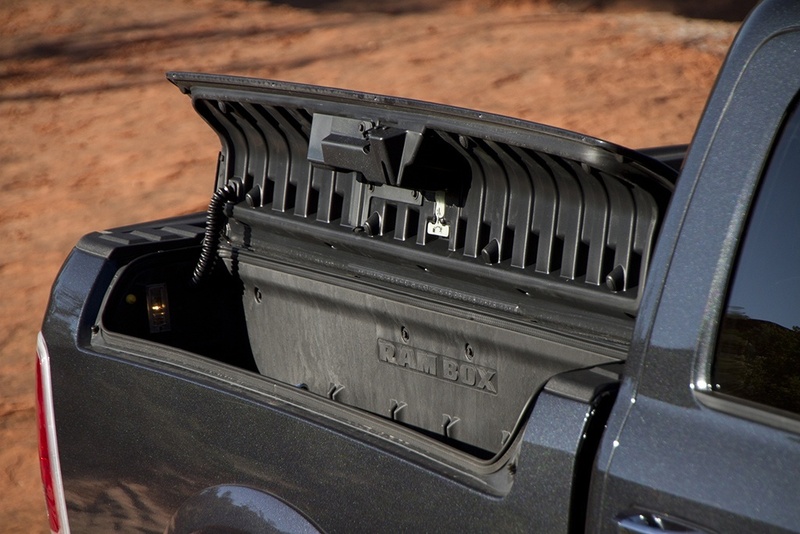 From a design point of view, the Ram cargo system provides a series of elegant solutions. But from a practical point of view, it makes sense for boating lifestyles and is easy to operate.